How did you celebrate UN World Happiness Day last Sunday? All of us had plenty to chew on with the release of the World Happiness Report 2016—the fourth edition since 2012. Prepared by the Sustainable Development Solutions Network, an international panel of economists, psychologists and public health experts convened by United Nations Secretary General Ban Ki-moon, the happiness ranking of 156 countries was based on individual responses to a global poll conducted by Gallup. The scholars found that three-quarters of the variation across countries could be explained by six variables: gross domestic product per capita (the rawest measure of a nation’s wealth); healthy years of life expectancy; social support; trust (as measured by perceived absence of corruption in government and business); perceived freedom to make life choices; and generosity (as measured by donations). The glaring omission on this list is the significance of resource consumption. 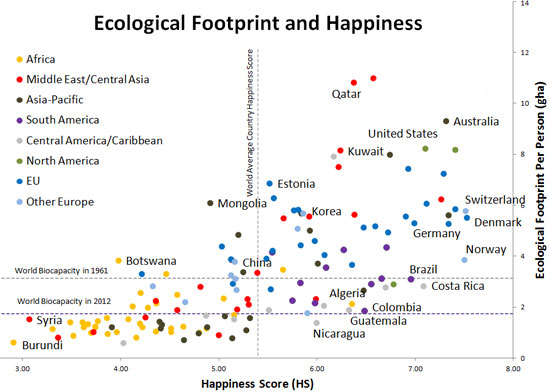 Yet combining the Happiness Index and Ecological Footprint data on one graph reveals interesting patterns. Unsurprisingly, the disturbing picture that emerges from the graph is that a high Ecological Footprint is the typical cost of happiness. In this year’s ranking, Denmark was No. 1, followed by Switzerland, Iceland, Norway, Finland, Canada, the Netherlands, New Zealand, Australia and Sweden. 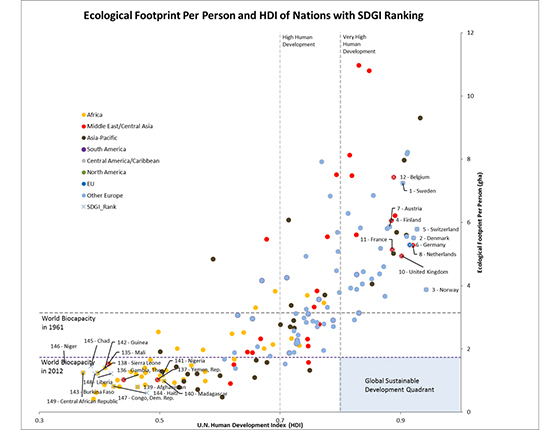 Most have strong social safety nets and high Ecological Footprints. At the bottom of the list lies Burundi, where a violent political crisis broke out last year. Burundi was preceded by Syria, Togo, Afghanistan, Benin, Rwanda, Guinea, Liberia, Tanzania and Madagascar. All of those are low-income countries—displaying a low Ecological Footprint—and many have been destabilized by war, disease or both. On the good news front, many countries in Central America (Costa Rica especially), South America and the Caribbean stand out overall for managing both a relatively high Happiness Index and a relatively low Ecological Footprint. 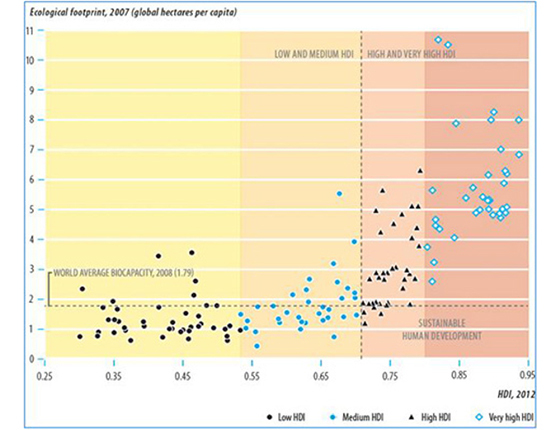 A more refined analysis reveals that only one country within the top 50 percentile of happiness (Nicaragua) has an Ecological Footprint of less than 1.7 global hectares – the amount of biocapacity currently available per person on the planet. The silver-lining, however, is that for any level of happiness score, there is a large spread in Ecological Footprint among countries. This is particularly true at the high happiness end of the spectrum. The good news here is that some countries are already demonstrating that it is possible to sustain a high level of happiness on a relatively small Ecological Footprint per capita. Why does happiness matter? Because it helps us live longer, healthier and more productive lives. And being happy is a great goal in itself. Since the king of Bhutan pioneered the Gross Happiness Product in 1972, happiness has emerged as an important development goal on the world stage. In July 2011, the United Nations even passed Resolution 65/309, placing “happiness” on the global development agenda. Going forward, the single most important question for local and national communities to explore is this: How can we thrive and be happy while living off a sustainable Ecological Footprint? To clarify, this would require for the world average Footprint to drop below 1.7 global hectares if we want to provision for wild species and for a growing human population, translating into a drastic reduction for most countries ranked high on the Happiness Index. Some initiatives are already pointing the way, such as Cloughjordan Ecovillage in Ireland. But the transformation will need to occur at a systemic level and on a massive scale for the change to be meaningful—infrastructures, industries, lifestyles. The challenge is simply massive. And so are the opportunities. In this respect, the Sustainable Development Goals, the Paris climate agreement, as well as policy agendas and business strategies such as the Green Economy and the Circular Economy, are significant steps in the right direction. We look forward to the day when residents in many more countries feel they can climb to the top of the ladder without leaving the planet lower down. 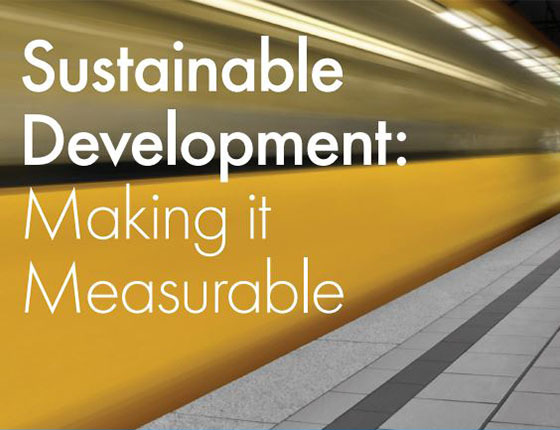 The true sustainability of sustainable development, as revealed by the Ecological Footprint and the UN Human Development Index. The Happy Planet Index, which uses the Ecological Footprint as a major metric of sustainable well-being.